My only surviving hive, BnB2, had been building up nicely this spring. My plan has always been to split BnB2 into the empty BnB1. At the last inspection, I found a bunch of drone brood (but no queen cells), which meant that the time to split was at hand. Other beeks in the area have reported drone brood and some queen cells, which means that swarm season is coming up fast. In Colorado, late April-June is prime swarm season. A swarm is the natural way that a hive reproduces. First, the queen lays drone eggs so that a drone population will be available to mate with newly hatched queens (but not her sisters). Then, the bees start raising new queens in queen cells. When the queens are about to hatch, the old queen and about half the worker bees leave the hive in search of a new home. They will fly in a group, occasionally stopping somewhere in a cluster, while scout bees venture out to find a new home. If you see a swarm, don’t reach for the pesticides or call an exterminator. Call your local beekeeping club or extension service. A beekeeper will gladly come out and take the free bees off your hands. Essentially, by splitting the hive in two, I’m creating an artificial swarm. I take the queen and some of the bees (much less than half) and put them in a new hive. 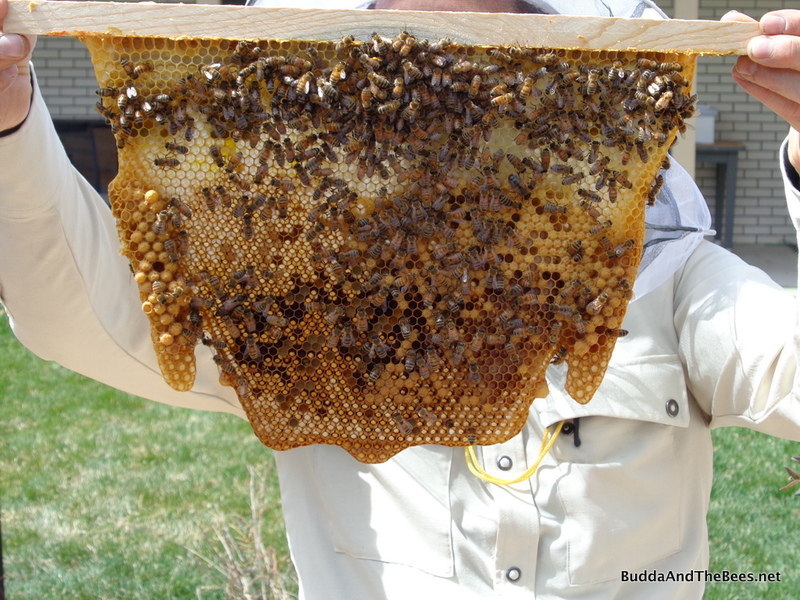 The old hive is now queenless and the workers will raise a new queen from one of the eggs in the comb. (or so the theory goes). I’ve been pretty nervous about doing the split, but my friend Julie over at Happy Hour at the Top Bar has some good information on splits and told me that once I do a split, it’ll seem like a piece of cake the next time. My son Patrick helped me with the split. He is a magnet for stings, so we started off joking how many times he’d get stung this day. We moved BnB1 over next to BnB2 to make the transfer easier. 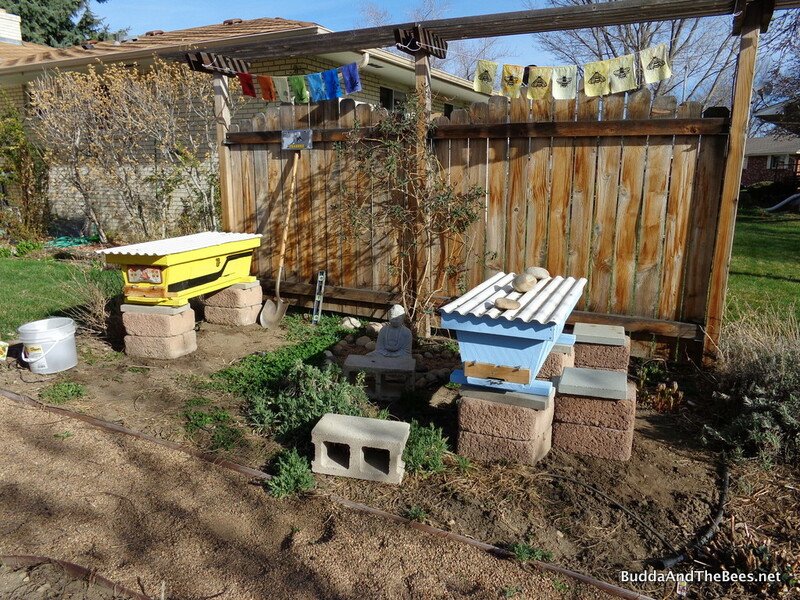 I’m in the process of rearranging the bee yard to make room for a few nucleus hives that I can use to raise more bees. I’m moving the existing hives back closer to the fence and off to the outer edges, so I can put the nucs in the middle. I’m thinking of making a little arbor over Buddha and putting the nucs on that, but as with most of my plans, it is not set in stone. I already placed some honey and other comb that I had left over into BnB1, so I didn’t need to take honey from BnB2 during the split. The usual plan is to take a couple of combs of honey and pollen and 3 frames of brood, plus the queen and put them into the new hive. So, I really only needed to find the queen and some good combs of brood and pollen to transfer. Previously, I had been adding honey combs to BnB2 as she built up and as I opened the back of the hive, most of the honey had been eaten. As I got into the brood area, there was lots of drone brood. I found this one wonky looking comb with drone brood, so I had Patrick take a picture of it. Each comb I picked up was covered with bees (see video below) and with so many bees and a lot of drones, the queen was hard to find. I went all the way through to the front without finding her and then went back the other way, picking out some good brood comb and transferring that over. Patrick was fooled by the drones a few times, but I finally found her on the wonky comb with capped brood above. In fact, as I looked at the picture afterwards, I see that I missed her there on the first time through. Queen was there all along! There were some empty queen cups on some of the frames, but I never found any full blown queen cells, so the hive was not planning to swarm any time soon. This hive liked to make queen cups last year, so I wasn’t surprised by the behavior this year. I transferred the wonky comb over with the queen over to BnB1 and then shook in some extra nurse bees to keep the brood tended. Just after I moved the queen comb over, I caught a large bee exiting the hive out of the corner of my eye. I’m hoping it was a drone and not the queen! I was a bit alarmed by the lack of honey and/or nectar, but the dandelions are just starting to come out in full force and the fruit trees are starting to flower. Since I still had some leftover frames of honey from last year, I went back later and added 2 of them to BnB2 just in case. I hope that the queen didn’t fly off, but if she did, I’m pretty sure there were some eggs transferred on the brood combs, so they should be able to raise a new queen. I probably should have cut off the queen cups on the combs that I transferred, just to be on the safe side. But since they were empty, I think I’m okay. I probably should have cut off the drone brood on the wonky comb, since the drones are just resource hogs and are not really needed for the new hive just yet. They also could have varroa mites on the larvae. I haven’t seen much activity on the front porch of BnB1 since the split. There are occasionally some guard bees shooing away other bees and wasps, but I expected some of the nurse bees to start doing orientation flights for foraging. I never heard the “mournful sound” that a queenless hive is supposed to make after removing the queen from BnB2. Watching the entrance, the colony seems to be doing exactly what it did before – bringing in lots of pollen. Next split, I think I’ll capture the queen first and moving her separately, instead of just moving whatever comb she is on. That will allow me to be more selective about the types of comb I move over. 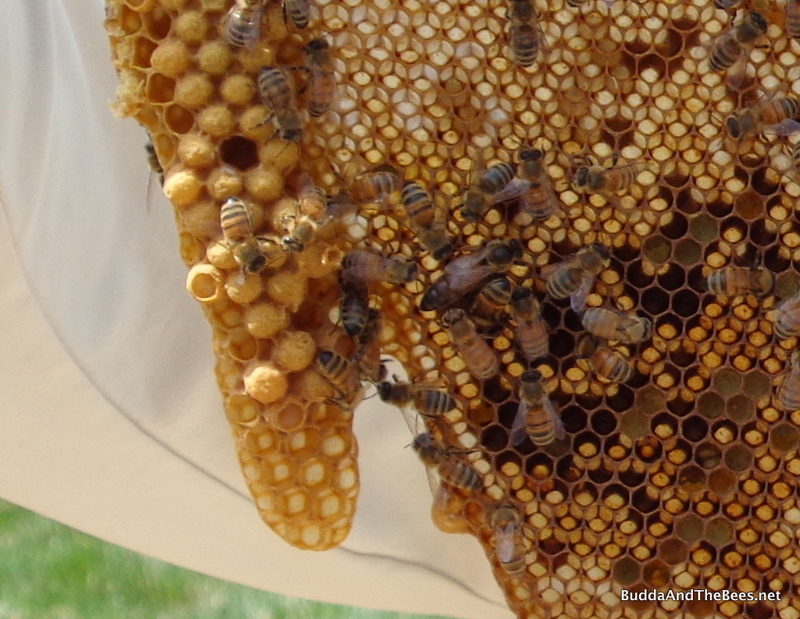 The wonky comb had some capped brood, but a lot of drone comb, uncapped brood (and probably eggs), and looking at the picture now, maybe some more developed queen cups. Now, I just have to sit back and wait for a week. Next weekend, I’ll check to see if the queen is still in BnB1 or whether that was her who flew away. I’ll also check BnB2 to see if they have started raising a new queen yet. If all goes well, it will be 3 weeks before the new queen hatches and then another week or so for her to take her mating flight and then start laying. The good news was that Patrick got away with zero stings even with no gloves on! Congratulations!!! You made your first split!!! I wouldn’t worry about not removing queen cups or drone brood from the split. Your split doesn’t have enough resources now to turn those queen cups into queen cells, and if they feel they can’t support the drones, they’ll get rid of them, too. Also, depending on how big your colony is, it can take awhile for the bees to figure out that the queen is gone. I think that’s why when requeening or making splits, they say to wait overnight before giving the bees a new queen. Anyway, that may be why you didn’t hear them roaring. BTW, my experience is that bees who are without a queen, but who have one in the making, continue acting normally, too. BTW, since you mentioned orientation flights, I usually put a branch or something over the entrance of the split to force foragers to reorient to the new hive rather than have them go back to the old one. Anyway, congratulations on your new split! That’s so exciting! Thanks for the confirmations, Julie. If I hadn’t done the split, I wouldn’t know that anything has changed in BnB2 – they just keep coming and going like nothing happened. It is a large colony and I’ll probably get another split out of it later in the year at the rate it’s going (if the new queen is as prolific as her mother). Good idea on the branch over the entrance. I also heard that turning the original hive a quarter turn helps the foragers go back to the new hive since the old one isn’t where they think. I’m going to move the original (BnB2) a foot to the left, but I think I’ll wait until I check on their queen rearing progress. He’s happy too! 😉 Thanks again for the encouragement. Next one will be a piece of cake!